So after 4 years of bookmarking Zenkichi on my yelp list, I finally made a date to eat here last night with my friend Emily. My expectations were high, I was a little under the weather but thankfully we were not disappointed. 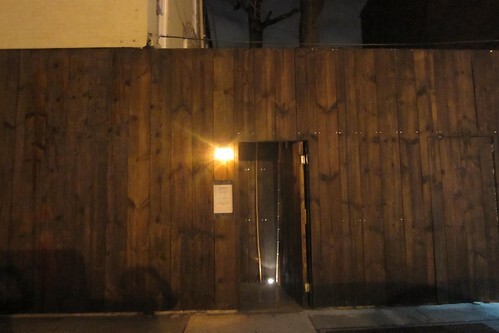 The restaurant is an illusive dark wood exterior with the door ajarred. 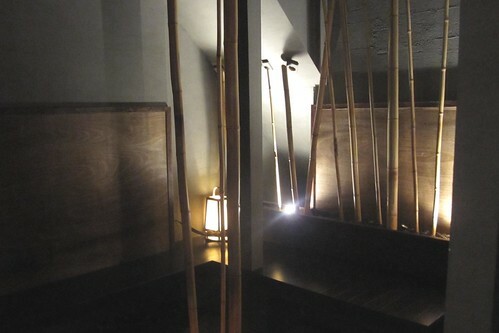 Inside is a labyrinth of small dining L-shaped nooks, bamboo curtains for privacy,and a little buzzer to ring in the waiter. The space--some call it romantic and intimate, but if youre claustrophobic its small and tiny. (Picture above is waiting room. Actual dining area is 1/4 its size). The floor is a mix of pebble and slate rock floors. Be careful of your step as you walk up and down the 3 floors. For drinks we ordered the $18 sake tasting menu. 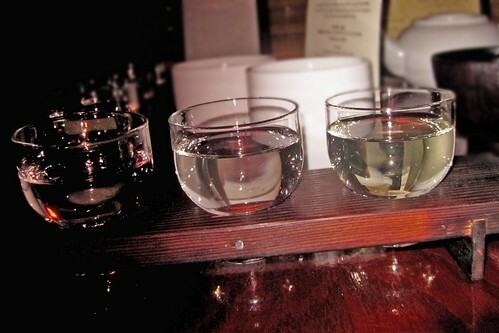 From left to right fruitier to light: Junmai Dai Ginjo, Junmai, Nanbu Binjin. The omakase menu ($95 for 2 ppl) was an 8 course meal. Some have complained that the portoins are small-- but its a tasting menu-- and once you eat all 8 dishes, you do become full. We did at least. 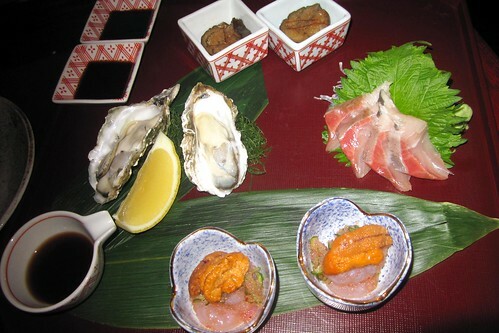 Anyways, picture above is a chilled plate-- Amaebi Sweet shrimp with Uni, Kumamoto Oyster, Yellowtail Sashimi, and sauteed eggplant. Miso Soup and the best salad Ive ever had. I cant believe Im impressed by a simple salad! Grilled Scallop from Hokkaido, turnip, onion ginger dressing on bed of salad (including arugala). Shrimp Tempura -- Tempuras are never on my list of things to eat-- but this is probably the best Ive ever had, topped with green chrysanthemum leaves. Jidori Gohan-- flavored rice with free range chicken and mushroom. Topped with sliced cucumbers. Again, something so simple done well. Saikyo Miso Cod-- buttery! Roasted Honey-Soy Duck-- served medium rare in honey-soy sauce served with green onions. For dessert, there was a list of 4 that you could choose. The Frozen Black Sesame Mousse was definitely the winner. My Rice Flour Trifle-- I ordered it because I had no idea what it was...what it was--was not sweet, served room temperature and...a dry cake like consistency. I thought a rice flour cake would be more like a mochi...but I guess that would have written mochi then. Oh well, 7 out of 8 is not bad!